Home > Used Vehicles > 2016 Toyota Tacoma TRD SPORT,4X4,AUTO,V-6,HEATED SEATS,TONNEAU COVER,BOARDS, AIR,TILT,CRUISE,PW,PL, LOCAL TRADE!!!! 2016 Toyota Tacoma TRD SPORT,4X4,AUTO,V-6,HEATED SEATS,TONNEAU COVER,BOARDS, AIR,TILT,CRUISE,PW,PL, LOCAL TRADE!!!! Cylinders: 3.5L V6 24V GDI DOHC - 6 cyl. Hurry on this one! Marked down from $36900 - you save $1000. 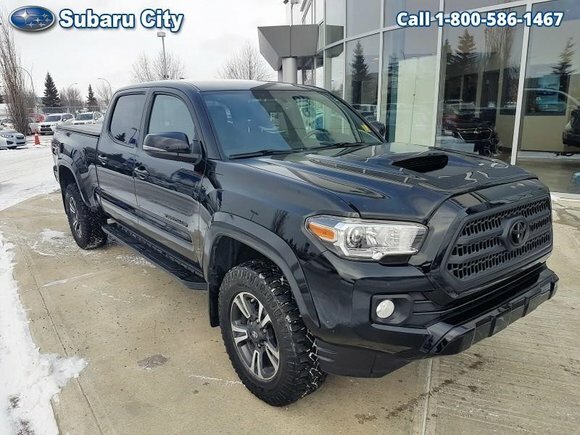 This 2016 Toyota Tacoma is for sale today in Edmonton. The 2016 Toyota Tacoma is highly versatile with proven off-road capability and offers the best payload capacity in its class. Toyota's midsize truck is essentially all new, with new exterior styling, improved engine performance, and a revised transmission. Additional enhancements also include a more refined and quieter interior. Tacoma's interior is built to handle whatever you throw at it or in it, and keep you comfortable no matter what the terrain, offering comfortable seats and an expansive outward view of the road ahead. This crew cab 4X4 pickup has 62001 kms. It's black in colour. It has an automatic transmission and is powered by a 3.5L V6 24V GDI DOHC engine. It has some remaining factory warranty for added peace of mind. Buy this vehicle now for the lowest bi-weekly payment of $233.44 with $3853 down for 84 months @ 5.99% APR O.A.C. ( taxes included, $790 Administration and Secure Ride included / Total cost of borrowing $7815 ). See dealer for details. Want to try the 2016 Toyota Tacoma TRD SPORT?